Ross & Cromarty Roots | Mill Street/Garve Road Burial Ground, Ullapool. Mill Street/Garve Road Burial Ground, Ullapool. 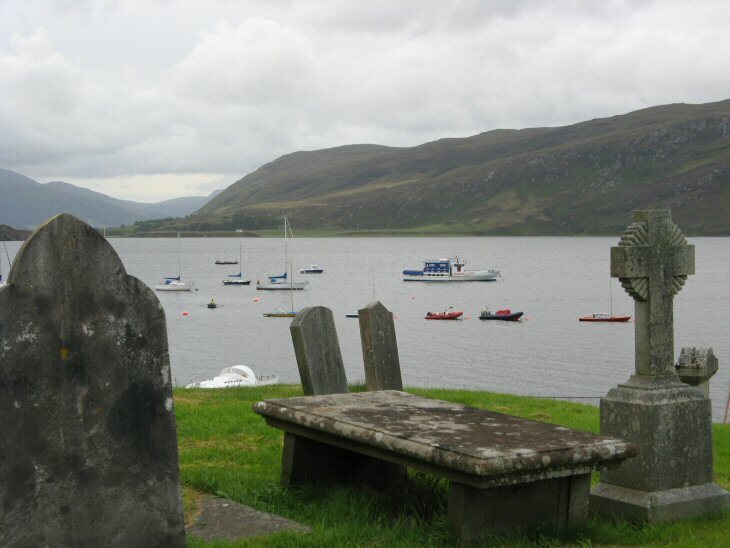 This is the oldest established burial ground in Ullapool, dating from the village creation in the late 18thC. It occupies a fine location on the seafront, overlooking Loch Broom, where the northbound main road turns sharply inland. Picture Added on 30 March 2008. My Great Great Grandfather, Kenneth Cameron was burried here in 1855. I think his Father, Donald Cameron may also be here. I think Donald died between 1850-1855. Do you have any record of names on these stones ? Added by Vickie on 26 June 2008. The records of inscriptions are in the Ullapool Museum. Several people surveyed the stones at different times (2002, 1994, 1988, 1986) and I would recommend asking the staff at the museum if they could look through the various records for you. I visited Ullapool recently and photographed a few stones but these did not include any Camerons. Added by Carolyn Cooper on 11 August 2014. The Mill St cemetery is now listed online on Find a Grave, and there is a Kenneth Cameron buried there, died March 30 1878. No one of that name earlier. It may be that there is a grave for your ancestor, but his stone is so weathered that it could not be recorded. Added by Carolyn Cooper on 15 July 2017.